Five years today I´ve had a lottie! And it´s only just straight (ish). So I ignored it totally and spent the day in the conservatory, potting up tomatoes and basil and the cut flowers and generally trying to find enough space to put all the trays of seedlings, so Sir can get to them to water. Found three more slugs and a snail while I was at it. I swear they´ve got teleport capability. Finally planted a few sunflowers. Went for the large ones - think the modules might be a tad small but better than sowing straight out and the seed getting munched before they even break surface. Popped to lottie after I escaped work (very late) and though in work clothes, potted around looking at everything and listening to the very loud birdsong. And took home more rhubarb and an enormous spring cabbage. Everything´s really starting to motor now. And there´s another parsnip up. 10/24 is still not terribly good though. All in all, not looking bad. 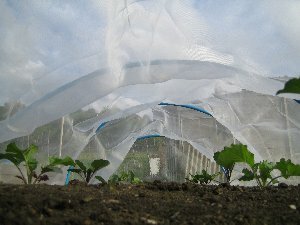 Might get up there tomorrow to do a bit more to the squash beds, but if not, it´s going to be 17th May at the earliest. Sniff. Back! Discovered that everything´s been growing like crazy, in complete opposition to last May. Apparently it´s been alternating very wet and very hot. Couldn´t resist trying to beat the jetlag by going up to the lottie, and fortuitously I took the hoes... jolly good job too. Weeds everywhere! Frantic hoeing of most of the bare beds, and some rather more careful hoeing of the occupied ones. Doesn´t help that the sieved soil seems to have hundreds of weed seeds in! Parsnips doing awfully, ditto carrots so I can only assume that the problem is that new formula Westland compost (which I complained about). Everything else is under ideal conditions, so I´m going to have to buy some different stuff to sow another lot. 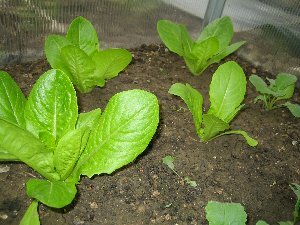 The cold frame romaine lettuce and radish are doing brilliantly; nice little plants now. Having had my taste for caesar salad rewoken in the US, I am looking forward to cutting a lettuce or two. Must sow more modules. Must also put the beans etc in or to chit! 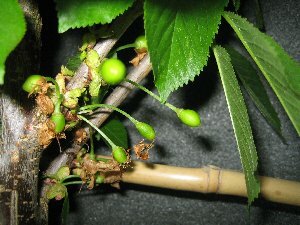 There are tiny cherries and plums and gages growing, not-so-tiny gooseberries (they seem to have exploded! ), the rhubarb is taking over the world and there are already loads of currants swelling. And the Bramley! 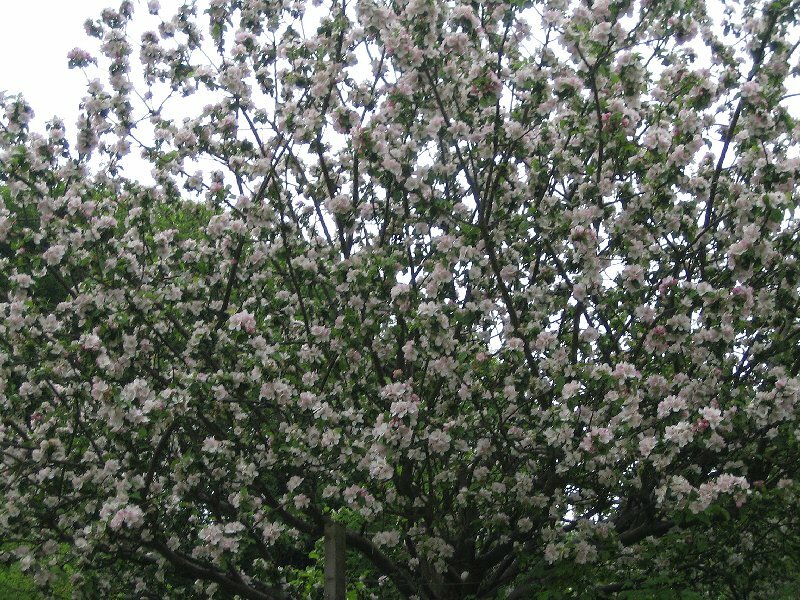 It´s COVERED in blossom. Absolutely amazing. I forgot how spectacular it is in the `on´ year. But will have to do something about the numbers of fruitlets this time! 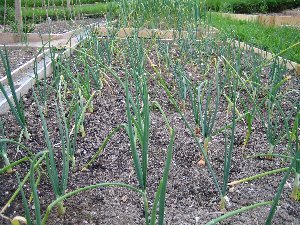 I also need another codling moth pheromone bait or I´ll have loads of unusable apples... the garlic is growing its flower heads (must make pesto again!) and the onions actually look like they will indeed be reasonable this year. Even if they are growing self-set chard in between! 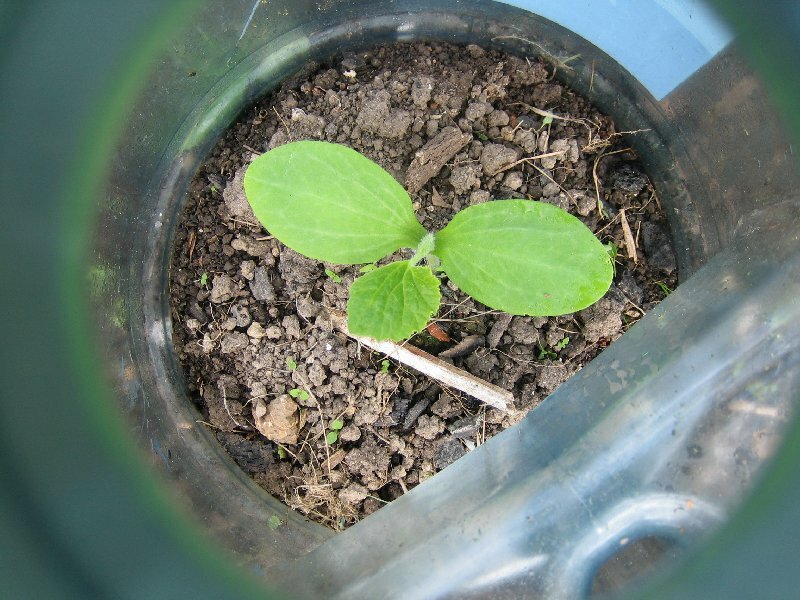 More amusingly on the self-sets, there are two cucurbits growing in the compost heap area! Dunno what from, but they are definitely squashes of some form. Popped a water bottle cloche on each one, so they´ll be a bit more protected and I won´t forget they´re there! Both are at the front, so will colonise an area currently bare. So they can stay there and one day I´ll find out what I´m growing! :) Pulled a lot of rhubarb. Had a look at the flower area, and there´s now quite a lot of gladdies coming up again. And even better, the BBC cactus flower dahlia is back! Put a bottle cloche over it in case we get a cold snap. I think the extra soil I parked on that bed has helped no end with insulating it from the cold winter. Now the gladdies are appearing, I can work out where to plant the new dahlias. Must put in the carnations I bought at my work´s plant sale, too. French beans germinating, Runners chitting, soya chitting and 48 potted up, sweetcorn chitting. Hope to use the wet conditions tomorrow to get the chitted seeds potted up if I´ve enough containers! Meanwhile the tomatoes are now in the cold frame for a few days before I open the lid up, and then they´ll harden off another few days to the start of June. 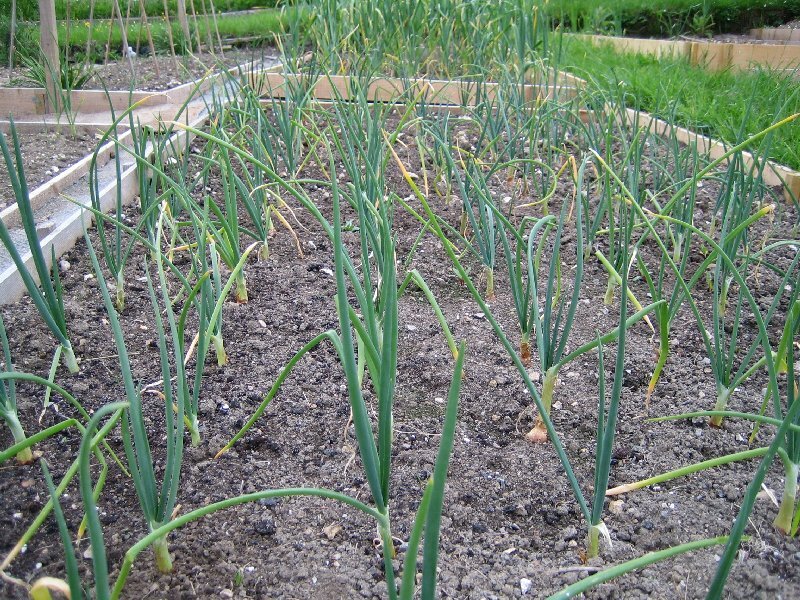 Then I might dare put them out, esp as the spring cabbages need fishing out of the bed where they´re going! Cucurbits going mad: need to start to harden them off too but not yet enough room in the frames. Next week! Beetroot needs planting out, and I need to sow more lettuce. Chucking it down with rain again today (another 7mm), so got on with the potting. Now have so little room in the conservatory that I´m almost afraid to sow anything else! Going on for 120 soya beans now planted up, as they are either definitely sprouting or showing signs of it. 29 sweetcorn, half the minicorn and 24 runners are also potted up. The French beans (which I didn´t chit) are popping up nicely. Ran out of compost about lunchtime so went to South Heath for more, and spent rather a lot on other things, nearly walking out without the compost! But I now have another tubtrug (useful little whatnots), as well as a refill for the pheromone trap for codling moth. Going to need that this year given the amount of blossom... Carried on potting when I got back, so the beetroots are in proper pots, the chillies are now in large ones and the rocket/coriander/corn salad modules are now split rather than being one crazy mess. Already eating the rocket... Managed to rearrange stuff so I could get in, and suddenly the sun came out. Dropped everything and ran to the lottie, and finished off the cabbage planting. 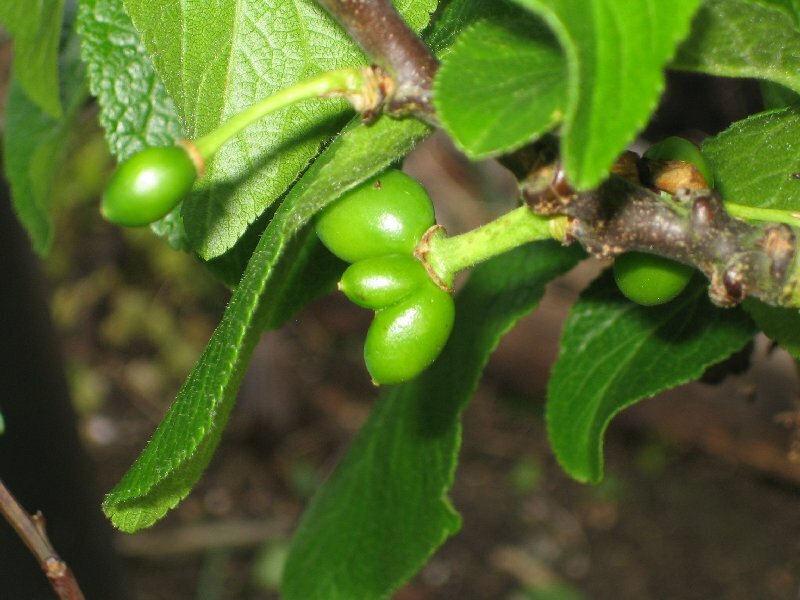 And it stayed nice, to my amazement, so I also got some weeding done, discovered I have 15 opium poppies growing (so I will not be bereft of poppyseed bread this year), found a mutant greengage (fasciated fruit!) and cut two ballhead spring cabbages. Half of one bit the dust for tea :) The Jonkheer van Tets redcurrant has put on nearly 10" of new growth and there´s no chance of me using last year´s netting now - way too small. It´s also heaving with berries, so it will have to be netted somehow! 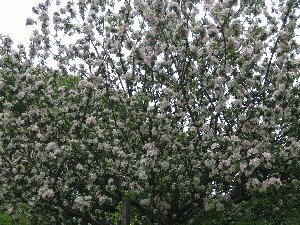 For that matter, everything in the orchard area is heaving with fruit or flowers - the later spring doesn´t seem to have hurt anything, and the rain is making everything go crazy. Just hope it doesn´t mean lush growth and disease at the expense of hardiness. Didn´t dare pull any more rhubarb - haven´t eaten all of last week´s yet! 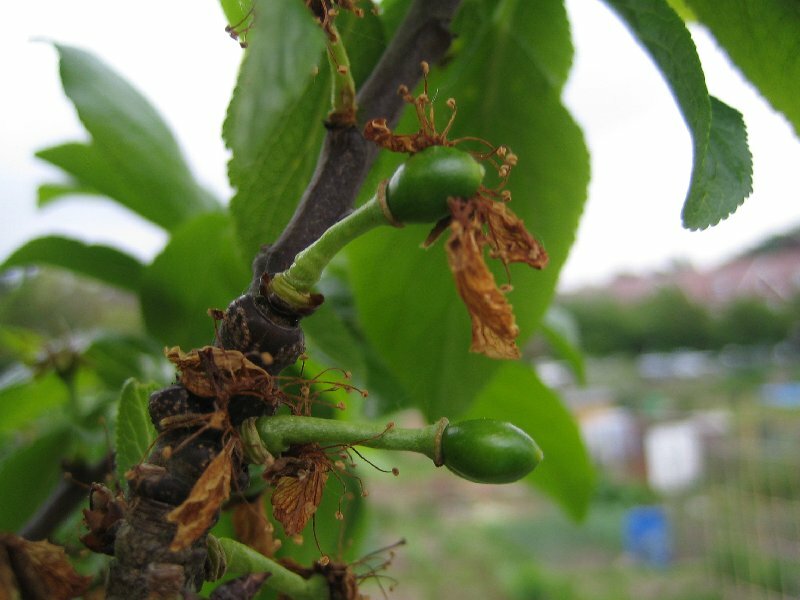 Fasciated greengages - I hope they make it to full size! 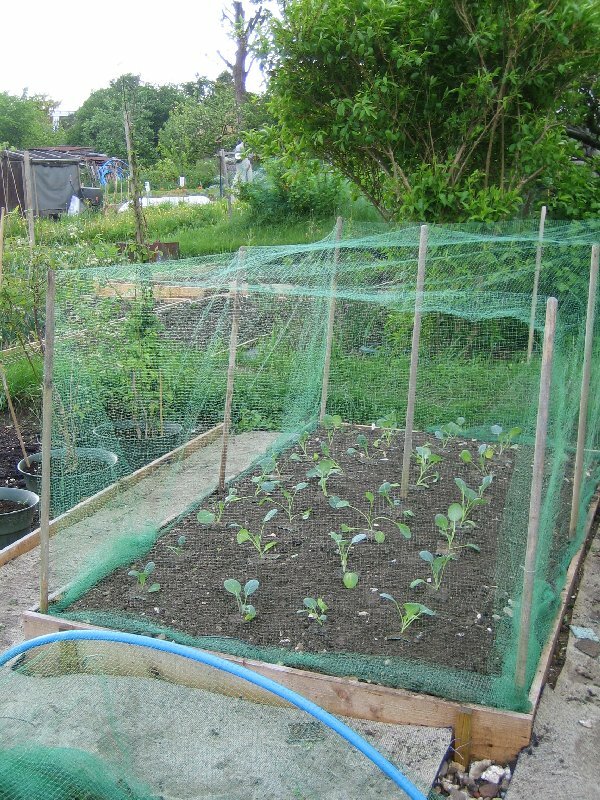 Summer cabbage cage, which will be replaced by the one in front of it when the spring cabbages are evicted! Cheated. With yet another purple sprouting broccoli crisis looming (next year I´m sowing them with the cabbages!) I spotted some at the Chenies sale and bought them. No idea as to variety as they´ve stopped selling the excellent Gardener´s Kitchen brand (grumble) but at least I´ve got backup. Put in back garden with a cloche over the top so they don´t get pigeoned. Will put in shade tomorrow night so they don´t get crisped in the forecast sunny weather on Sunday. With luck the Rudolphs will get a bit bigger. I´ve put slug bait in containers in the bottom of the cold frame, and will carefully remove dead slugs/snails and put in the bin to stop them getting into the food chain. 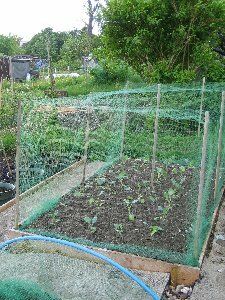 I´m really fed up of losing brassicas to the blasted pests and at least with a concrete cold frame base, the pellets can´t get into the soil. Hurrah! With six days to go in May, we´ve had above average rainfall for the month (63mm - average is 59 here in the Chilterns...). Seems like it´s done nothing but rain for the past three weeks, which shows how much we normally get... Off to Cornwall tomorrow morning so I shall miss out on the weekend´s forecast dry weather here. Will put out more stuff to harden off before I go. Now have about 50 French Beans up (I´d sown 80) so want to get them out before they go leggy. Wail! I want it to warm up so I can start hardening stuff off properly! I want my conservatory back!